We have been keeping chickens on and off for the last 10 years. 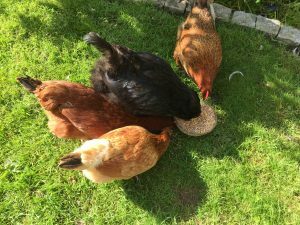 Our first lot of chickens were rescued from a neighbour who, sadly, couldn’t look after them anymore. They were the most rag-tag bunch of chickens you have ever seen but they were so sweet that we couldn’t help but love them. None of them were purebred, they were all mutts but between them, they laid us fabulously delicious eggs for many years. After our first foray into the addictive world of everything chicken, it was a few years before we took the plunge again. Not through lack of trying on my part but sometimes, life happens and it just wasn’t practical. Now, life is once again, for the time being, playing ball and my chicken count is up to seven. I have plans though and fingers crossed, my chickeny empire is set to expand. 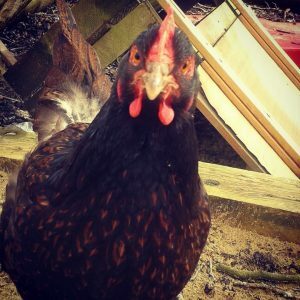 Our chickens are still mostly a rag-tag bunch and only two of them are an actual breed. 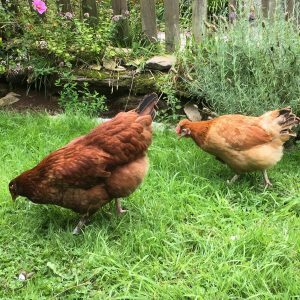 Our two girls Marigold and Lobelia are our only pure breed hens, they are Devon Blue’s. They came from a breeder in Devon, Taylor Made Poultry and they lay the most gorgeous pale blue eggs. The others girls came from a farmer friend and their heritage, well, who knows. 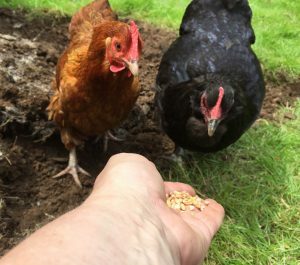 So, meet the girls who provide us with delicious eggs everyday. Each have different personalities, weird, I know, but totally true. They all lay different coloured eggs and each of them like different things to eat. I swear sometimes it’s like have a house full of toddlers again. Lobelia and Marigold love fresh salad leaves and cabbage. They all adore sweetcorn and porridge and if there is spare spaghetti, there is always a rugby scrum to get at it. They also love watermelon however, there is one thing they love above anything else. Something they just can’t get enough of and that’s any and all of our seedlings, flowers and pretty much everything else in our garden that they can get their beaks into. 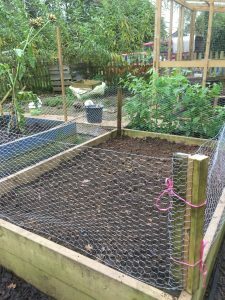 Our garden is a veritable chicken smörgåsbord so, you can understand why we have had to put chicken wire around all of the raised beds. Once they get in, they are voracious. They do, however, also help out in the garden and do an amazing job of turning over the compost heaps. 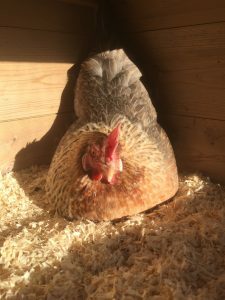 We throw all the sawdust bedding from both the chicken and the duck houses onto the compost heap. The ducks and chickens scratch around in it, breaking it up and digging it over. In no time at all, the heap has been flattened and reduced to amazingly good compost which we can use on our veg beds. In return for letting them decimate our garden, the girls produce the most delicious eggs for us. We eat eggs a lot! We kinda have to. 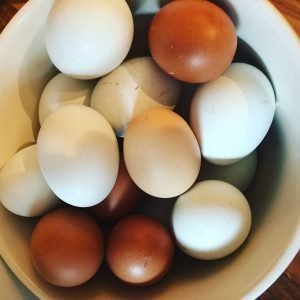 With seven chickens, for most of the year, we get between six and seven eggs a day, thats a LOT of eggs. 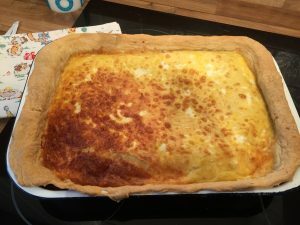 Last year, in an attempt to use up some of the glut we had, I made the biggest quiche I have ever made. 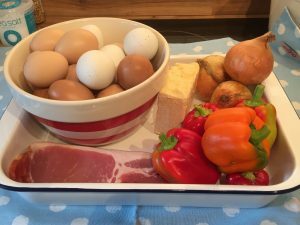 A 19 egg quiche!! It was delicious but I am seriously going to have to find some new egg recipes. It’s only February and I’m already getting five eggs a day. 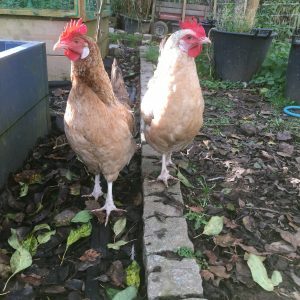 With only two of us and if I’m going to increase my flock, I’m really going to have to up my game recipe-wise so, if anyone has any eggy recipes that they can recommend, please let us know. Marigold relaxing in the sun. One final thing ……. the order of eggs in the line up in the top picture goes Duck, Chicken, Chicken, Chicken, Chicken, Fairy. Firstly, our one and only female duck has just started laying. Go BB (click here for a link to our duck post) The last egg, the teeny, tiny one is called a fairy egg. Apparently, it’s bit of a glitch in the hens system just after the hens start laying again after the winter. Cute isn’t it.